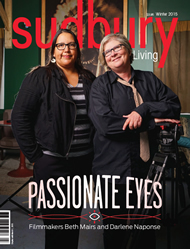 The Fall 2013 issue of Sudbury Living has a report on the new School of Architecture. It opened in September in downtown Sudbury. 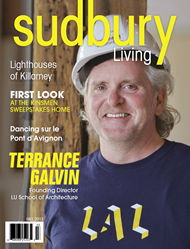 Meet the new director, Terrance Galvin who is bring new energy and new ideas to Sudbury.The Fall issue also has stories on features on “our Canadian in Paris,” opera singer Rayanne Dupuis; SNOLAB, and Stack Beer. 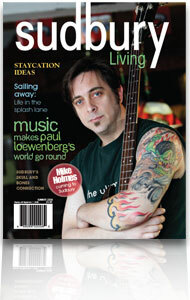 In the Summer 2013 issue meet Franco-Ontarian musician, actor and broadcaster Stef Paquette.Stef Paquette is appearing in his first English television drama, Hard Rock Medical on TVO. 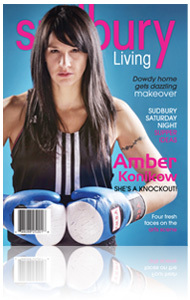 The Spring 2013 issue of Sudbury Living has an inspiring feature story on boxer/runner Amber Konikow. She’s the woman who boxed with Liberal leader Justin Trudeau last December. 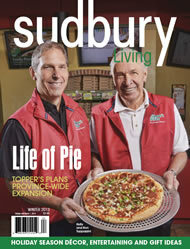 Given the city’s beer and bingo image, wouldn’t you know it: the top two guys at The Beer Store are from Sudbury. It makes a great story. 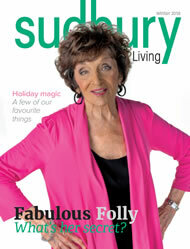 Also in the Spring issue, Sudbury Living gives readers a look at the last days of Sudbury General Hospital. Haunted by a Hospital is a must read by Mick Lowe. 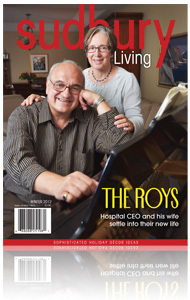 The Winter 2012 edition of Sudbury Living introduces readers to The Roys. Dr. Denis Roy is the CEO of Health Sciences North. 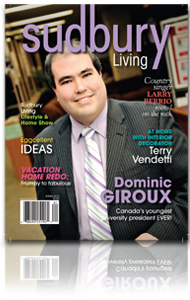 His wife, Monique, is a GP with a part-time practice in Sturgeon Falls. Writer Benita Hart interviews this interesting couple. The Winter edition also has parenting advice, health news, and a delightful article about grey owls by naturalist Chris Blomme. Writer and avid sailor Colin Hayward shares his experiences navigating the canals of France. The Fall 2012 issue has style: six pages of fashion. 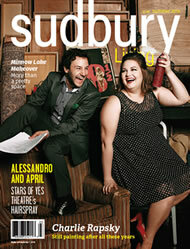 Plus a features on dynamic dance teacher Jan Fregonese and Sudbury’s iconic flatiron building. Savour summer a little longer. 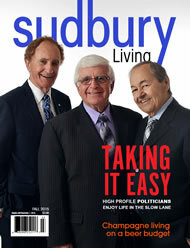 The Summer 2012 edition of Sudbury Living is now available in PDF format. 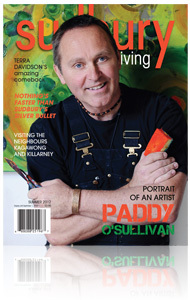 Discover the artwork of Paddy O’Sullivan. Find out about the Dodge Mystery on Manitoulin Island. Learn the secrets of growing fruit trees in a cold climate. And more! 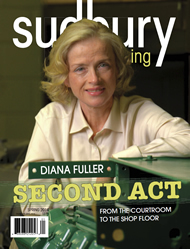 If you missed the Spring 2012 issue, you can read it now in PDF format. 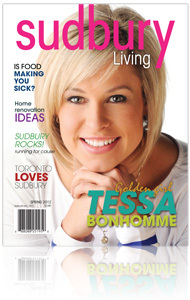 Read about Sudbury’s Golden Girl, Tess Bonhomme. 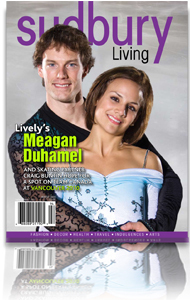 The Olympic gold medalist and star of Battle of the Blades is wowing the entire country. 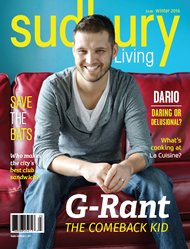 Dana Young has written an extensive article on tea, and has the scoop on where to find a perfect cuppa in Sudbury. Plus profiles on lawyer and good-deed doer Perry Dellelce and young humanitarian Erica Hall as well as dozens of ideas for the home and garden. 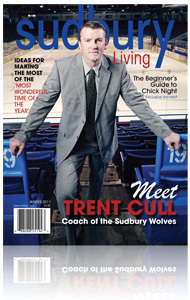 The Winter 2011 issue features a cover story on Trent Cull, the coach of the Sudbury Wolves. Readers will also enjoy a health-related story on how to get a good night sleep? Did you know a company in Sudbury makes mattresses? Plus ideas for winter getaways. And more. 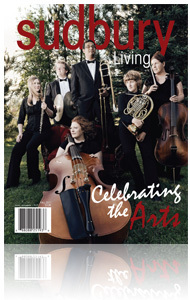 Sudbury Living Celebrates the Arts in the Fall issue. 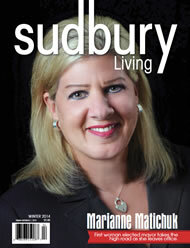 Sudbury Living is available at selected newsstands in the city including Black Cat and Chapters. 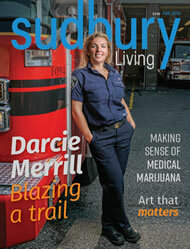 It is also available at the Art Gallery of Sudbury, Kitchen Bits on The Kingsway, Northern Life at 158 Elgin St. and the Your Independent Grocer at The Four Corners. If your newsstand doesn’t have it, ask why not??? 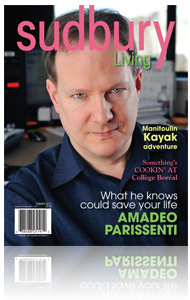 The Summer 2011 introduces readers to Amadeo Parissenti, head researcher at the Northern Ontario Regional Cancer Centre. He and his team are doing some ground-breaking work. 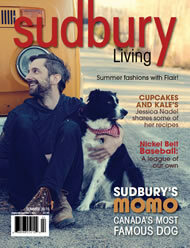 The issue also features Sudbury Style: Harley-Davidson clothing and accessories for the whole family, even the dog. There’s a profile of social activist Vicki Kett who has been helping the people of Haiti longer before the devastating earthquake. 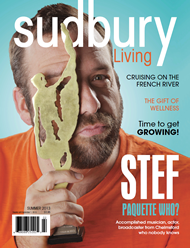 Find our about the woman who inspired the man who gave Sudbury its name. 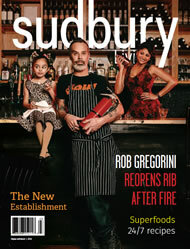 The Spring 2011 issue of Sudbury Living is on newsstands now! Our largest issue yet! 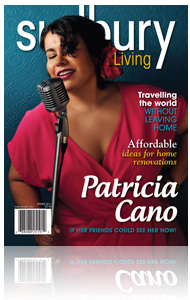 Read about singer/actor Patricia Cano’s recent success at the National Arts Centre in Ottawa. Plus real renovations for real life. A feature interview with Terry O’Reilly, host of CBC Radio’s Age of Persuasion who got his start on CKSO TV. 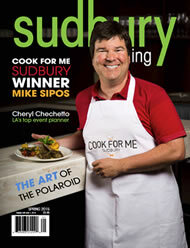 Go around the world with Dana Young who takes a tour of Sudbury’s international restaurants. 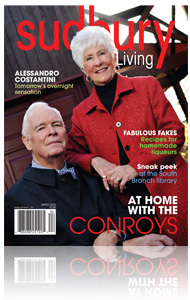 The Winter 2010 issue introduces readers to one of Sudbury’s power couples, the Conroys. Inside: Meet up-and-coming actor Alessandro Costantini. Plus recipes for fabulous liqueurs you can make at home and more! Greater Sudbury Police Chief Frank Elsner has worked as a police officer for a quarter of a century. Part of that time, he worked undercover. 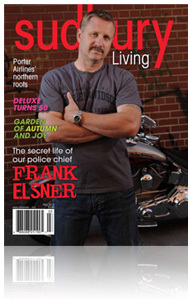 Vicki Gilhula profiles the unassuming top cop and tell his fascinating story in the Fall issue. 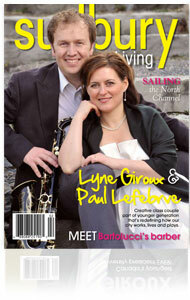 Creative Class Couple Big cities have no appeal for dermatologist Dr. Lyne Giroux and lawyer Paul A. Lefebvre. They balance demanding careers, family life and their community work without hustle or hassle. 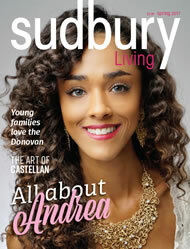 They are members of a new generation of movers and shakers in Sudbury. 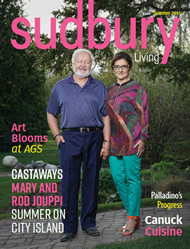 Meet them in the Summer issue of Sudbury Living. Laurentian University president Dominic Giroux is in a hurry. Writer Benita Hart talks to Giroux to find out how he got so far in so little time. At 34, Giroux is younger than many students. Also in the Spring issue, get in the mood for spring gardening with a visit to an inspiring garden in the city’s South End. Decorator Terry Vendetti shares some of his ideas for creating a cozy comfort zone. Country music singer Larry Berrio is on his way to making it big. You’ll want to know more about him. The Spring issue’s got him covered. 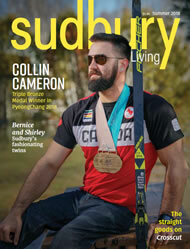 The Winter 2009 issue of Sudbury Living features an article on Sudbury’s Olympians. 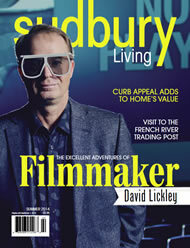 As well, a fabulous fur fashions spread and a feature on singer/songwriter Andy Lowe. 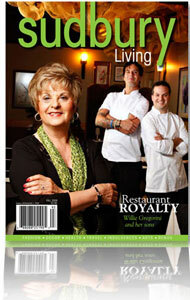 Willie Gregorini and her sons Rob and Mark have changed the way Sudburians eat. They own four of the city’s restaurants and each one is unique. 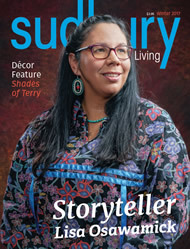 In this issue, also learn about the latest in bathroom decor and take a stroll in Muiriel McLeod and Ernie Checkeris’s country garden. Paul Loewenberg is living his dream. He is the booker, promoter and manager of the Towne House Tavern, artistic director of Northern Lights Festival Boréal, host of a popular radio show, and a songwriter/performer with some of Sudbury’s most popular garage bands. 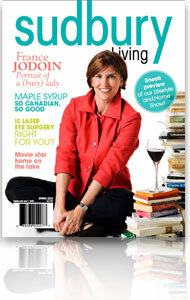 Former journalist turned literary advocate France Jodoin balances the demands of a family, career and community work with a challenging hobby…a vineyard on Manitoulin Island. 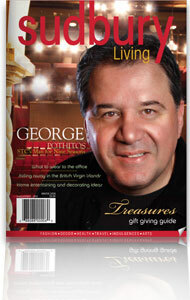 After 10 years as the creative director at Sudbury Theatre Centre, George Pothitos is heading east to Halifax. It was a good run. 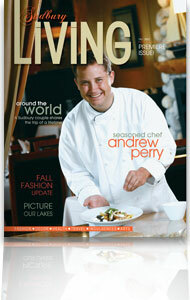 The Winter issue also features stories on chef Stuart Raymond by acclaimed writer Mick Lowe. Sean Costello is a scary, scary storyteller. His latest book is Here After, a paranormal thriller about a missing child. This is Costello’s first book in several years. He has a full-time job as an anesthesiologist. In the same issue, editor Vicki Gilhula takes readers to the Johnston Cranberry Marsh in Bala. Writer Todd Robson profiles Kate Maki and Nathan Lawr, singer/songwriters who tour throughout Canada but call Sudbury home. 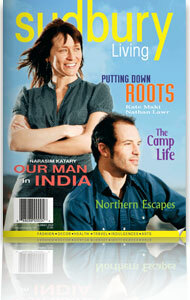 The issue also includes a report on Narasim Katary’s good work in India. 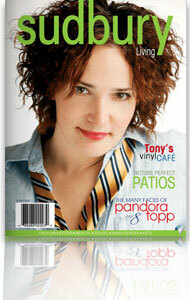 Read all about Pandora Topp, the talented chantuese. Highlights of 2008 for this gifted singer/actress included working with Michael Buble and performing for Margaret Atwood. 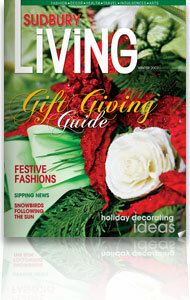 The Winter issue of Sudbury Living features “Keep It Simple” holiday decorating ideas. Reader will meet textile artist Ann Suzuki; the chef at Mr. Prime Rib; composer Robert Lemay; and naturopathic doctor Chris Mazzuchin. 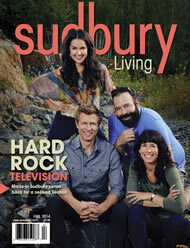 Welcome to the first issue of Sudbury Living. 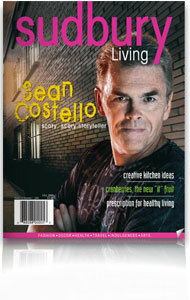 Planning a new magazine is like designing a dream house. We want each section to be interesting and inviting. We want to look beautiful, and to be a little out of the ordinary.